Christopher Columbus discovered the island of Hispaniola in 1492, its name means "Spanish Island". The eastern part of the island is occupied by the Dominican Republic, the western third being Haiti. The native Taino Amerindians - who inhabited the island of Hispaniola when it was discovered by COLUMBUS in 1492 - were virtually annihilated by Spanish settlers within 25 years. In the early 17th century, the French established a presence on Hispaniola, and in 1697, Spain ceded to the French the western third of the island, which later became Haiti. The French colony, based on forestry and sugar-related industries, became one of the wealthiest in the Caribbean, but only through the heavy importation of African slaves and considerable environmental degradation. In the late 18th century, Haiti's nearly half million slaves revolted under Toussaint L'OUVERTURE. After a prolonged struggle, Haiti became the first black republic to declare its independence in 1804. The poorest country in the Western Hemisphere, Haiti has been plagued by political violence for most of its history. After an armed rebellion led to the departure of President Jean-Betrand ARISTIDE in February 2004, an interim government took office to organize new elections under the auspices of the United Nations Stabilization Mission in Haiti (MINUSTAH). Continued violence and technical delays have prompted repeated postponements, and Haiti missed the constitutionally-mandated presidential inauguration date of 7 February 2006. 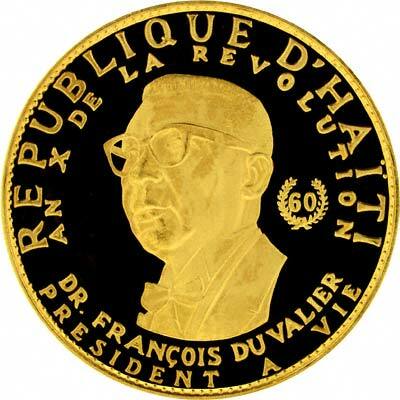 Although Haitian pattern gold coins were issued between 1814 and 1854, its gold coinage issue did not begin until 1967, when five different denominations were issued, from 20 gourdes to 1,000 gourdes, to commemorate the tenth anniversary of one of its revolutions. 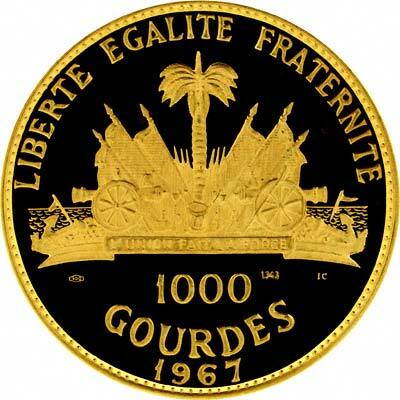 The 1,000 gourdes coin shown is a seriously large and impressive coin, issued for the tenth anniversary of independence, but also celebrating the 60th birthday of Duvalier. Together with '900' (the gold fineness) in a small cartouche, and some other numerals and letters. The number 1343 in our photograph may be a serial number, the IC may be a mintmark. For silver and base metal coins of Haiti, please look at our original Chard Coins website.